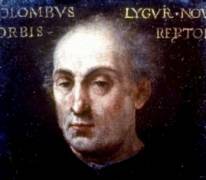 Christopher Columbus did not believe the earth was round. Neither did he believe that it was flat. "I am therefore forced to conclude this about the world: I have found that its shape is not that of a true sphere, as scholars have told us, but more like that of a pear... it is like a round ball, with a protuberance on one side, like a woman's breast..."
Perhaps the admiral had been so long at sea that his recollection of female anatomy was getting hazy; but it's more likely that his calculations were in error. One of his contemporaries, Capt. Eugenio de Salazar, wrote, "Oh, how God shows his omnipotence by placing this subtle and very important art of navigating a ship on the stupid judgment and in the rough hands of these pilots! You may hear them asking one another, 'How many degrees, have you logged...' One says, '16', another 'nearly 20', and another '13... Whether they claim 3 or 300, none agree and none know the truth." Columbus disregarded his pilots and made his own calculations. His journal reveals him gloating each time his figures proved accurate and theirs wrong. He consistently made landfall on the uncharted islands of the West Indies during four separate voyages which changed the map of the world. Columbus first went to sea from his home in Genoa, Italy, when he was 11 years old. Before he entered the service of Spain, he had traveled as far north as Iceland and as far south as Guinea, Africa. He had fought pirates, survived storms and suffered shipwreck. Later in life he wrote, "I have followed the seas for 23 years, without being on shore any space of time worth accounting and have seen all the East and West, and been to the North... and as I go on making discoveries, they show themselves better and better... "
The most famous of his "better and better" discoveries was the West Indies. Three weeks after Columbus first sighted land, he sent two soldiers ashore on the island of Espanola. They reported that the inhabitants carried lighted firebrands around in broad daylight! "These tubes they call by the name of TABACOS. I knew many...who were addicted to the use of them, and on being reproached with it as a bad habit, replied that they could not bring themselves to give it up. I do not see what relish or benefit they could find in them." "These people practice no kind of idolatry; on the contrary they firmly believe that all strength and power, and if fact all good things are in Heaven, and that I had come down from thence with these ships and sailors..."
Because the Indians viewed the Spaniards as "celestial people", they were anxious to obtain any trinkets the sailors wished to trade. Tiny bells used in Spain on the legs of falcons were especially prized. So were the red caps which Columbus brought as trade goods. Columbus ordered his men to treat the Indians civilly, "because these are the best and most gentle people in the world". On one occasion, the admiral's trade policy averted a war. The Santa Maria was anchored in the mouth of a deep river near a large Indian town. At first, the Indians ran away in fright, but soon an armed mob assembled along the shore. Some warriors approached the Spanish ship in five dugout canoes, each carrying between 75 and 150 men. They blocked the passage out of the river. Columbus rowed alone toward the thickest concentration of warriors "all of them naked, and stained red, some with tufts of feathers in their hands and all having javelins. I approached them and gave them some pieces of bread, demanding their javelins, which they gave me for a hawk's bell to one, a little brass ring to another and a few beads to another. In this manner they were all pacified". In a short time, these natives traded away all their weapons. 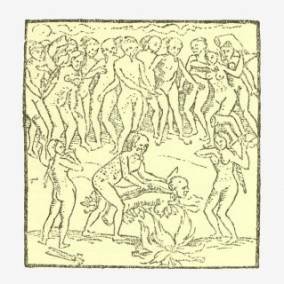 On each of the islands Columbus visited, the Indians constantly told him about the people of Caniba, whom all the Indians dreaded. At first Columbus identified the Caniba as the people of the Great Khan, ruler of China. He assumed the Khan sent his men among the islands to take slaves and that the Indians only imagined horror stories concerning the captors. Columbus did not believe it. The third island Columbus touched on during his second voyage he named TODOS LOS SANTOS. He sent one of his captains ashore to investigate a waterfall. The man landed near an Indian village. 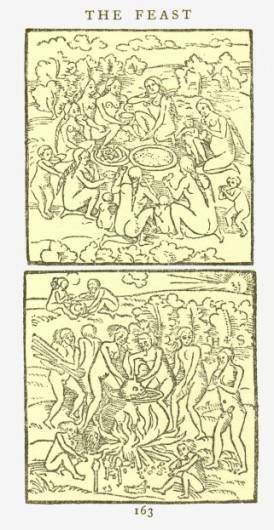 The Indians fled and when the Spaniard entered one house, he discovered a boiling stewpot filled with human parts. Since the cannibals lacked refrigeration, they used a horribly ingenous method to preserve fresh meat--they butchered living persons. Beginning with the victim's legs, to hinder his escape, they sliced off only as much flesh as they planned to cook for one meal. This practice kept the victim alive, and the meat fresh, for future meals. "The Admiral shall...force and compel all those who sail with him...to treat the said Indians very well and lovingly and abstain from doing them any injury." 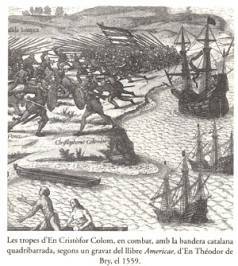 The Indian massacre of the Spanish colony at Navidad changed that official attitude. The Pinta, the Nina, and the Santa Maria sailed from Casrdiz in 1492; only the Pinta and Nina returned. Columbus wrecked his flagship on a coral reef off the coast of Haiti on Christmas Eve. "But as it pleased Our Lord, at Midnight, it being a dead calm, and the sea perfectly motionless as a cup, the whole crew... went off to sleep, leaving the ship in the care of a boy," Columbus wrote in his journal. "The current carried her imperceptibly toward the shoals upon which she struck with a noise that might be heard a league off." Columbus reported most of his crew panicked and deserted. He cut away the mast hoping to refloat the Santa Maria, but she stuck fast and opened between the ribs. Columbus went ashore and waited for dawn. The ship was totally ravaged. 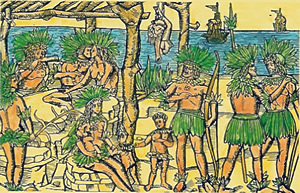 Guacanagari, a local chief, welcomed the Spaniards ashore and gave them a feast of "shrimps, game and other viands." He wept over their dilemma and consoled Columbus with a gift of a large mask," with great pieces of gold at the ears, eyes and other places...along with many jewels of the same metal..."
Columbus then "began to be convinced that Our Lord had permitted the shipwreck in order that he might choose this place for a settlement... It was a piece of good fortune and the determined will of God that the ship should be wrecked...that the Spaniards might remain." 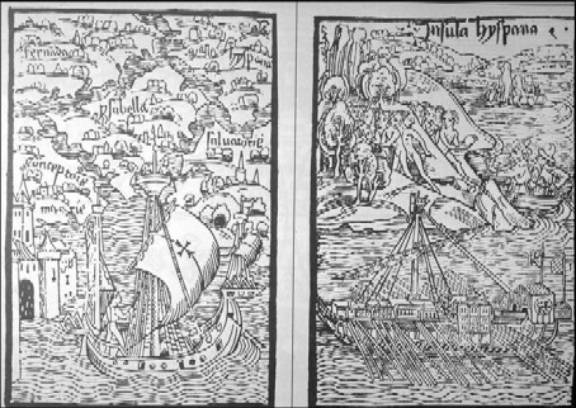 Columbus stripped all the supplies from the grounded ship, used the ship's timbers to construct a fort, selected crewmen to remain behind, and then ordered them to collect a ton of gold and to discover the gold mines before his return from Castile. Everyone seemed happy with that arrangement. They named the colony NAVIDAD. However, when Columbus returned 11 months later with a fleet of 17 ships, he discovered the unburied remains of his men, tied hand and foot, near the charred fort. 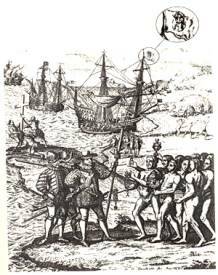 Guacanagari claimed another tribe had attacked and Columbus believed in his good will; but the other Spaniards urged reprisals, which they took with a vengeance after Columbus left the area with a few ship to continue his discoveries. Columbus sailed to island after island, each more beautiful than the last. Of one he wrote, "The singing of the little birds is such that it appears a man would wish never to leave here, and flocks of parrots obscure the sun." Although he had originally hoped to establish a trade route with the Orient, he had discovered a New World. During his third voyage he wrote, "I have come to believe that this is a vast continent, hitherto unknown... And now the truth appears, and before long will appear in still greater measure. And if this is a continent, it is a wonderful thing and all men of learning will agree..."
Although Columbus was amazed and delighted with his discoveries, he was also in trouble. His journal complains that his eyes bled and that for long stretches of time he was blind. 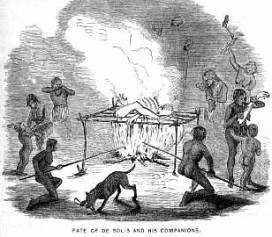 In the colony at ESPANOLA, his deputy governor had exterminated 100,000 Indians and instigated rebellion, mutiny and civil war among the Spanish settlers. Mosquitoes, yellow fever and lack of food added to the general discontent. 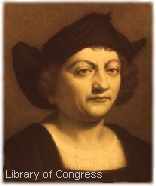 A royal inspector ,sent out from Spain, blamed all the trouble on Columbus' ineptitude and shipped him home in irons. Mobs in the streets of Granada taunted, calling him "The Admiral of Mosquitoes, The Man who discovered the lands of vanity and fraud, The Cemetery of Castilian noblemen." Columbus straightened out affairs enough to be allowed a fourth voyage. But it was a sad undertaking. He met storm, sharks, mutiny, hostile tribes, shipwreck and near starvation. He and a few faithful crewmen were marooned for a year and five days on Jamaica. "I am ruined.,, Heaven pity me, and, may the earth weep for me. Of worldly goods I have not a blanca to give in charity; and I have moved away from the practices of religion in the Indies." Through such dejection he still kept his wits. The threatening Indians had cut off the stranded men's food supply. Columbus summoned the Indian leaders and announced that in three days he intended to put out the light of the moon. He had read in ALMANACH PERPETUUM of a total eclipse due on February 29, 1504. Hundreds of skeptical Indians assembled on the beach to jeer at Columbus on the crucial night. As shadow engulfed the moon, the Indians panicked, begging Columbus to pray to his God to restore the moon. He did so and his men's food supply was restored. Finally a rescue vessel arrived to transport the stranded admiral. He eventually returned to Spain. Columbus died in Spain two years after his return from his forth voyage. He did not die in poverty; he left a considerable estate. It was not in proportion to the rewards he should have received. "The great success of this enterprise is not to be ascribed to my own merits... The Lord often granting to men what they never imagine themselves capable of effecting...even in that which appears impossible; in this manner has it happened to me who have succeeded in an undertaking never before accomplished by man."